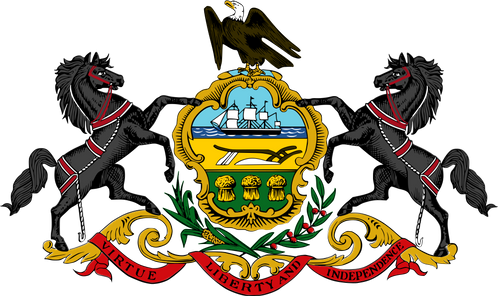 The second state to ratify the U.S. Constitution in 1787, Pennsylvania is situated southeast of Lake Erie and west of the Delaware River. Its largest city is Philadelphia, the home of the Declaration of Independence, and its capital is Harrisburg. The Appalachian Mountains, specifically the Allegheny mountain range, cut through the middle of the state. Pennsylvania's northwestern corner is home to Lake Erie shoreline and the city of Erie. Pittsburgh and Philadelphia lie in the state's southwest and southeast corners, respectively. South-central Pennsylvania is mostly farmland, and this rural area south of Harrisburg is known as the Susquehanna Valley. Nearby Lancaster County is "Amish Country". North of the greater Philadelphia area lie the Lehigh Valley, the Pocono Mountains and the Wyoming Valley metropolis of the state's northeastern corner, formed by Wilkes-Barre and Scranton. Pennsylvania has no shortage of Interstates and U.S. routes. Interstate 80 provides a more than 300-mile east-west corridor across the middle of the state. Interstate 76 consists of 350 miles between the Ohio border and the New Jersey border; most of I-76 comprises the Pennsylvania Turnpike. Interstate 70, which joins the Turnpike from New Stanton to Breezewood, cuts the state's southwestern corner. Interstate 79 is western Pennsylvania's main north-south highway, and links Pittsburgh with Erie. Interstate 90 serves Erie in the northwest portion of the state. Interstate 81 stretches about 235 miles between the Maryland and New York state lines, and serves Carlisle, Harrisburg, Hazleton and Scranton. Interstate 78 begins at I-81 between Harrisburg and Lebanon and passes through the Lehigh Valley city of Allentown. Interstate 83 enters Pennsylvania from Maryland and bisects York County, passes to the east of York city, heads up through Harrisburg and to an end at I-81. Interstate 95 serves as a north-south Interstate corridor through greater Philadelphia. Interstate 99 connects the Pennsylvania Turnpike at Bedford with I-80 near State College. Three-digit Interstate highways within Pennsylvania includes Interstate 476, the longest 3DI in the entire country - it stretches 131 miles between the Philadelphia suburb of Chester and Scranton, most of the way as the Pennsylvania Turnpike's Northeast Extension - as well as the Pittsburgh-area Interstate 376 and Interstate 279, the Valley Forge-New Jersey designation of the Turnpike as Interstate 276, the Interstate 176 Turnpike-Reading connector, Interstate 180 in the Williamsport area and Interstate 380 outside of Scranton. U.S. Route 11 parallels I-81 for most of its length through Pennsylvania. U.S. Route 15 passes by Gettysburg and through Harrisburg, joins with U.S. 11 as it parallels the Susquehanna River, then bisects Williamsport and Mansfield before heading into New York. U.S. Route 6 provides an east-west corridor through extreme northern Pennsylvania, passing through Warren, Bradford, Scranton and several other cities. U.S. Route 1 serves as a southeastern Pennsylvania corridor. U.S. Route 19 is a feeder for I-79, and U.S. Route 20 for I-90. U.S. Route 40 passes through Uniontown and Washington in the state's southwest corner. U.S. Route 322 winds its way through central and southern cities across Pennsylvania. U.S. routes 119, 219 and 220 are all main thoroughfares within the mountainous regions of western Pennsylvania. U.S. Route 30 passes through the state as the Lincoln Highway and provides a direct link between Pittsburgh and Philadelphia. U.S. Route 22 serves as a feeder for such Interstates as I-376, I-81 and I-78.